In newer homes in the Houston area, you will see forced hot air systems in bathrooms; however, gas bathroom heaters and electric bathroom heaters were common at one time. My home was built in 1964, and the builder decided to run a forced air system to heat and cool my bathrooms. This was not common, because the idea was to open your window to rid that space of moisture from a hot shower or bath. With a window open on a cold winter’s day, you would never have a warm bathroom. Fortunately, Houston has few days that are seriously cold. The better solution at the time was to install a bathroom heater. 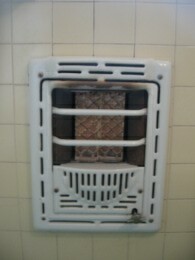 A gas bathroom heater was preferred over the electric one, because they heated the room so much faster. Electric units were easier to operate, and safer around children. Most bathroom heaters like these have been removed by homeowners, but new style heaters are still available (the towel rack bathroom heater looks nice). The picture comes from a house that I inspected last week, which had gas bathroom heaters that were in fairly good condition. The units have a gas line plumbed through the wall to the unit. A knob allows you to turn the gas on, which delivers the gas to a pipe with holes in it (much like what you would see in a gas grill). Once lit with a match, the flames were near ceramic blocks that are heated up. These ceramic blocks are still produced for restaurants who have those racks for grilling whole chickens or the meat for shwarmas. These blocks sent the heat out into the room. Electric versions had a switch at the base. Once turned on, the wires in the unit glowed red releasing heat into the room. The first thing to check would be rust on the housing of the unit. The bathroom heater pictured was in fairly good shape. With so much moisture in the bathrooms, parts on these heaters can begin to break down with rust. I then check for rust in the unit, particularly on the delivery tube for the gas. I also check for any other damage to this pipe. Damage here could mean that the flames will not be going where intended. I check the knob and its connection to the gas valve. Knobs go missing, and it is not easy to operate these gas heaters without the knob. I turn the knob on to see if the gas is flowing. At this point you can light the unit to better check it out. The ceramic blocks are a cream color when new. In this house, much of the cream color could still be seen. The blocks turn black with long use. When black, they begin to break apart. The blocks in the unit pictured had light use, some black on the cream. Are gas bathroom heaters a safety issue? When children grew up with this heater, they knew not to play with them. If you are not using them though, but they are still functional, a gas bathroom heater makes a tempting play thing. The gas is easy to turn on, and a child may not think to turn this off. If lit, the units come become quite hot. Since I have my children cook with me, I know that they are tempted to touch these hot surfaces. I am lucky than for all of my children the word “hot” entered their vocabulary early. However, I still do not trust my younger children near hot surfaces. I remember that my brother and I wanted to burn pieces of paper in our electric heater. Education is the key. Vigilance is what a parent needs. One item that I did not mention under inspecting the heater is the gas shut off valve. These units have a gas shut off on them, but it is safer to have another shut off separate from the unit. This was not done by builders on a regular basis. To shut off the gas to work on the unit, all of the gas to the house had to be shut off. If you are not going to be using the unit, it might be wise to have the gas line to the unit capped to prevent gas flow. The entire gas bathroom heater could be removed with the gas lines capped in the walls, or the valve could be removed, and a cap placed on the line there. Often your plumber would be able to handle this work, and you should discuss the best option with him. I like the look of gas bathroom heaters, and I think that I could use one in my bathroom, but they are a concern with younger children in the house. It is up to you whether to keep them or not, just be aware of the problems. This entry was posted on Monday, April 19th, 2010 at 11:47 am	and is filed under Home Maintenance-Consumer Info. You can follow any responses to this entry through the RSS 2.0 feed. I have one of these gas bathroom heaters in my home. Does anyone know where I can get a replacement shut-off knob and replacement ceramic blocks? Honestly, I have only seen them at salvage yards. Your best option may be contacting a company that deals with gas appliance installation, since they may know. Hillards Hardware in Van Texas sells them.